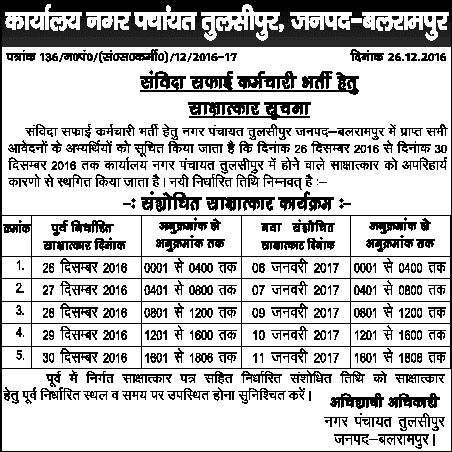 UP Safai Karmi Interview Call Letter 2018 is available from December to January 2019 UP Safai Karmi interview call letter will be available in all Uttar Pradesh website. 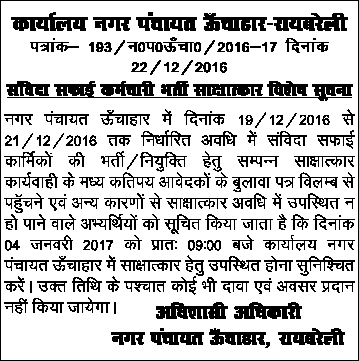 Nagar Nigam Safaikarmchari Admit Card Kanpur Lucknow result and Joining date. 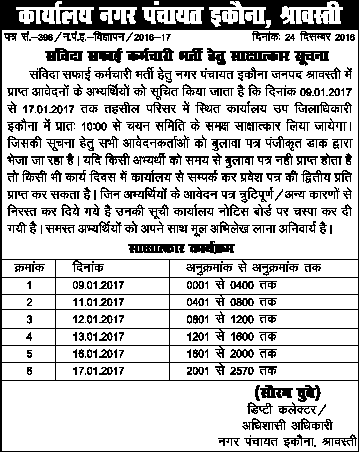 UP Allahabad Safai Karmi Interview Call Letter download online application form from Safai Karmi Bharti latest news for eligible candidates. 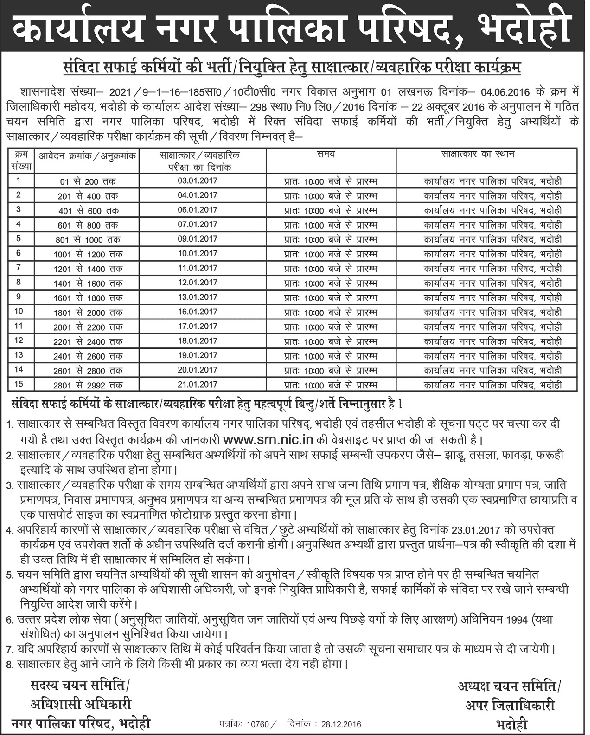 UP Kanpur Safai Karmi Interview call letter 2018 visit website kmc.up.nic.in candidate called for safaikarmchari interview. 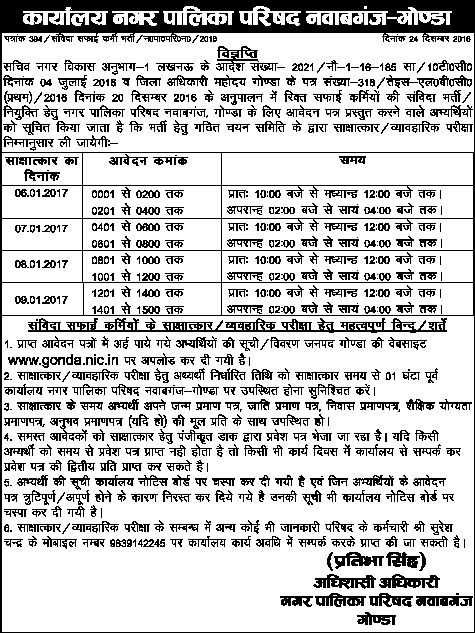 UP Safai Karmi Interview Date declared last date of applying online vacancy. 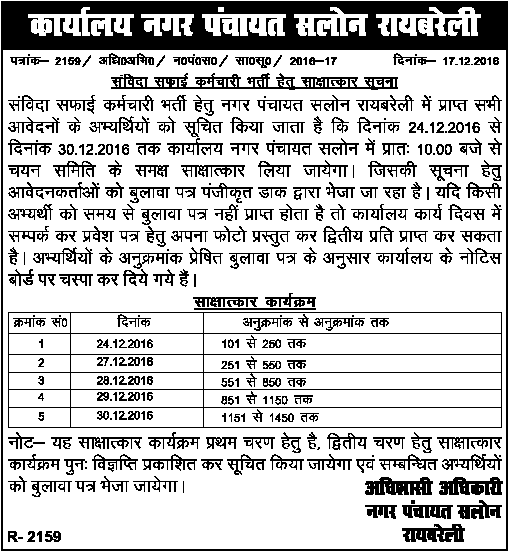 UP Samvida Safai Karmi Bhart Latest News 2018: Seeing the high court order nagar viksa vibhag cancelled the 40,000 safai kari bharti. Government order has given under nagar nigam board to cancel safai karmi vacancy in up. 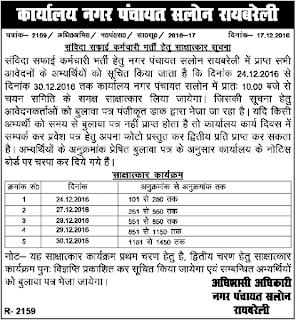 UP Safai Karmi Allahabad Interview & Bharti Cancelled Latest News: Important notice related to safai kami bharti. Shsanadesh sankhya: 2021/9-1-16-185 SA/10TC , Date 4 July 2016 against rit hearing number 25403/2016 Ashif khan vs state of up passes order dates 17.11.2016. ke anupalan mein Sashandesh sankhya 3814/9-1-16-135RIT/2016, 30 September to cancel safai karmi bharti. 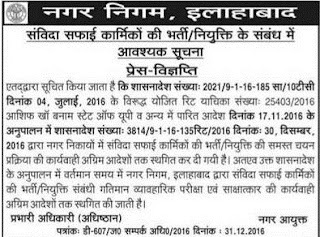 UP Safai Karmi Recruitment Interview Date 2018: In some District UP Nagar Nigam Board has changed the safai karmi interview call letter date. All candidates who are waiting for their interview call, they are advice to see daily amar ujala, dainik jagran and Live hindustan news paper. 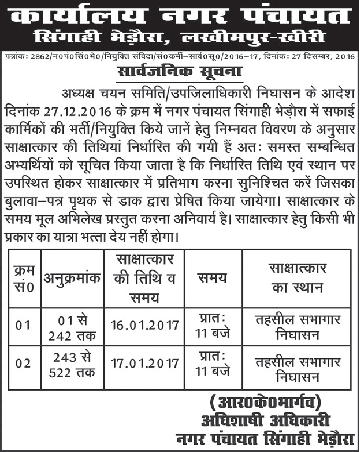 See below some new update on UP Safai karmi latest news 27 December 2016. 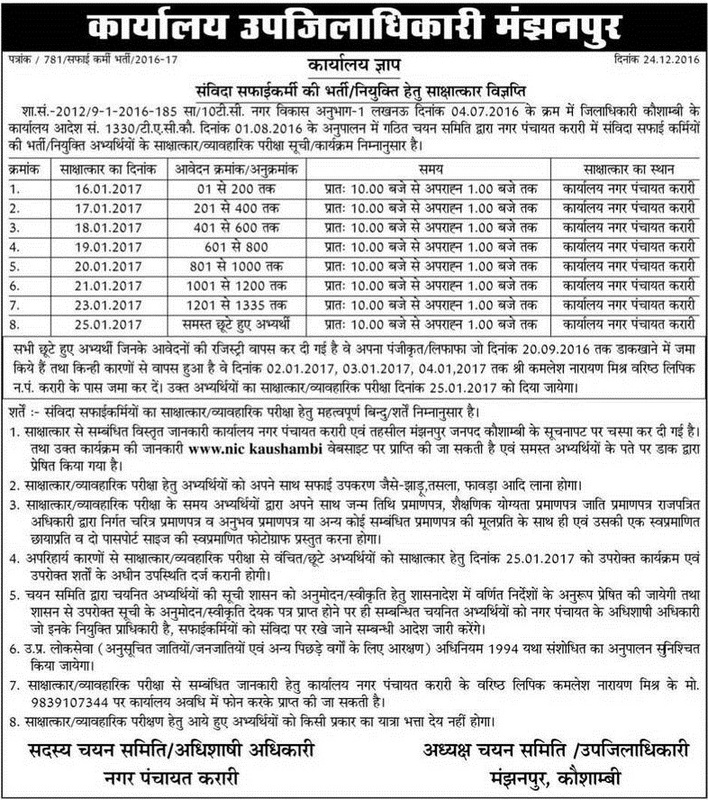 Lucknow Safai Karmi Bharti 2018 Latest News 21 December 2016: UP Nagar Nigam Lucknow Safai Karmi Interview Date started from 22 December. Total 2000 candidates admit card was updated and every day 200 candidates called on Interview call letter see below notification. 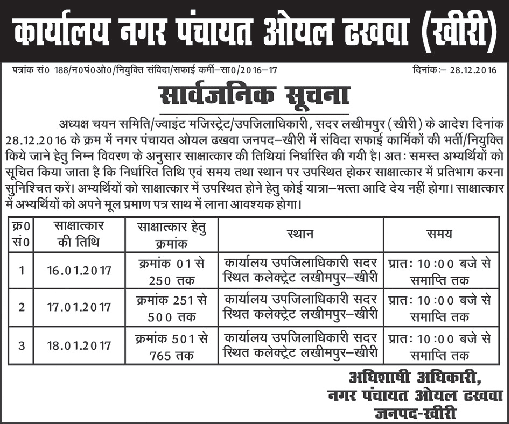 UP Safai Karmi Interview 2018:- In UP Nagar Nigam Safai Karmi interview A required number (more than three times of vacancies) of shortlisted candidates will be called for UP Safai Karmi exam date UP Safai Karmi interview will be held in nagar nigam Palika, nagar Palika parishad and nagar Panchayat from the place of residence to the place of interview, medical examination and back only on submission of the original tickets. 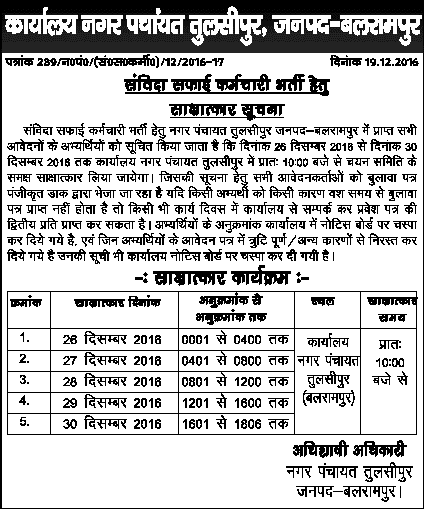 On 13 December Safai Karmi Amethi Interview call letter will be starting from 17 December 2016. 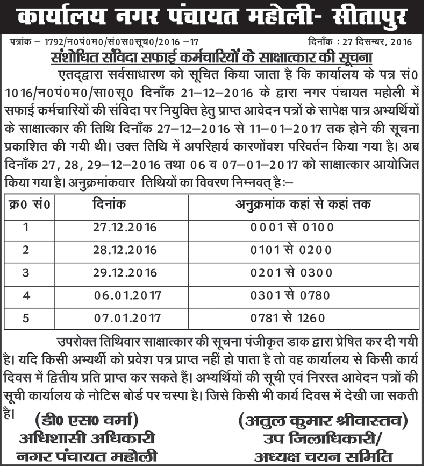 Amethi Interview Centre will held and last date is 20 December 2016 and after that amethi safai karmi merit list will be prepared and published in January 2017.
safaikarmchari Only the required number of up Safai Karmi cut off marks in short listed candidates (as per vacancy and UP Safai Karmi merit list 2016) who are pronounced medically fit in all respect will be sent call letters to report to the various hospitals in Armed Forces. 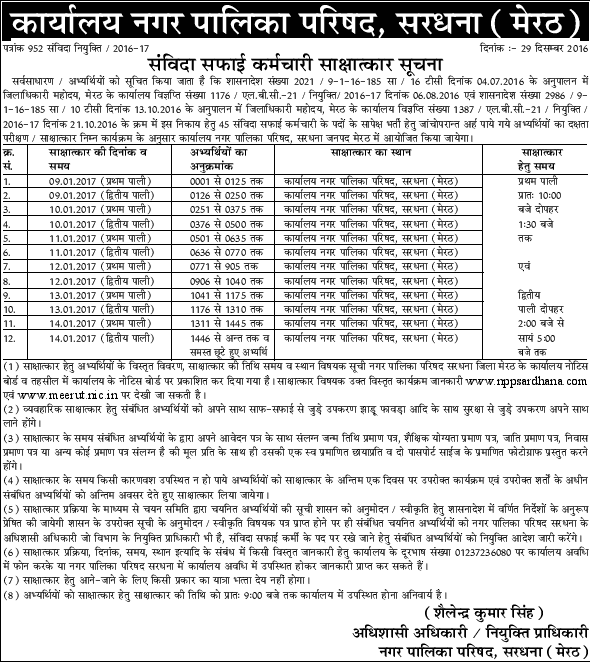 Lucknow safai karmi interview date for pratapgarh from Lucknow safai karmi interview date. if found not in the possession of documents as per eligibility criteria, will be rendered ineligible to appear for the interview and the selection is liable to be cancelled. In such cases no TA will be applicable.